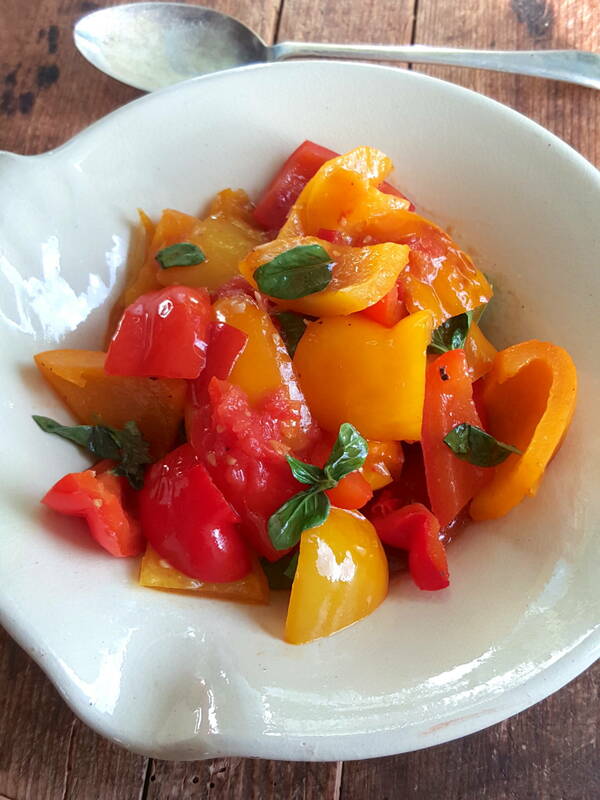 Peppers in the pan – the smell as these cook will transport you to Italy! 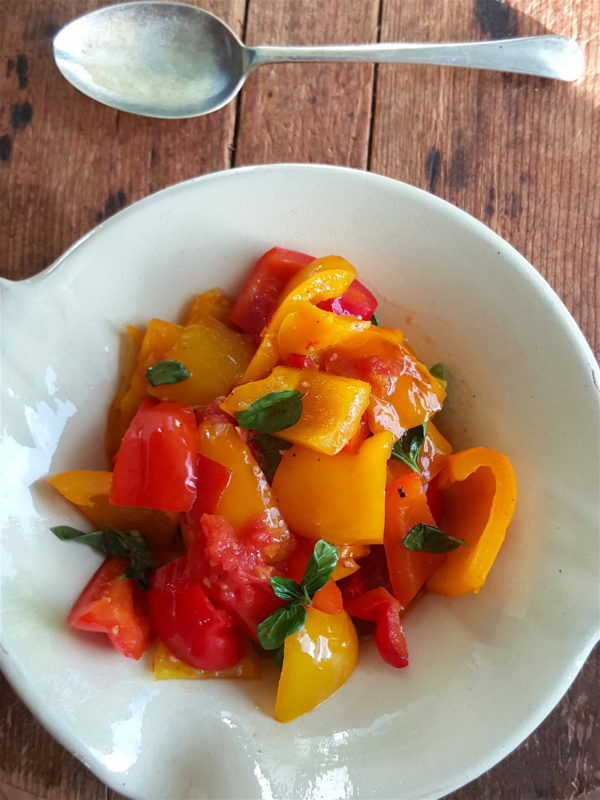 I love peppers cooked in olive oil – it takes me right back to Italy. Try these with other vegetables for an all-vegetable meal (baked zucchini or eggplant, creamy potatoes, spicy lentils, etc,) or with roast chicken, or pork or veal snitzel. 1 Halve peppers, remove cores and seeds and cut peppers into thick chunks. Heat oil in a medium-large frying pan (skillet) over gentle heat. Cook 5-7 minutes until sizzling and starting to soften. Add lemon zest, salt, pepper, tomatoes and chilli, if using. 2 Cover pan with a lid and cook gently for 10 minutes, until peppers are nicely tender. Stir in sherry vinegar and basil. Sherry vinegar gives nice woody notes and a sharp bite to balance the sweetness of the peppers. If you don’t have any, use a good red wine vinegar. WE get beautiful coloured bell peppers all year round here in our supermarkets in New Hampshire, USA! I use them in a lot of dishes, often just simply sliced as a side to colour up a main dish, and add extra vitamins and eye appeal. I fry them up, but you have provided me with an incentive to up my game, and do them your way described here.! That’s great Rex. We love to inspire people to keep on cooking and trying new things. So delish with lamb chops and fried potatoes (easy Saturday night dinner ) for the family . Thanks Barb, nice and colourful too. Hopefully, you are getting peppers at a decent price – or even from your garden.